They didn't have a bankruptcy law in the U.K. because that was something that went through Brussels. What were the medical regulations in the U.K.? None because it was all being done through the European Union. Why is it so complicated? Because you have to create a state. It's even more complicated than I'm making it out to be because you have the devolved administrations. So Scotland, Wales and Northern Ireland have their own regulatory frameworks for many things as well. Theresa May once described the deal that was voted down this week as “the best and only deal possible.” What's her Plan B? It's impossible to say. Her Plan B is almost irrelevant. It's a question of what she can negotiate with the European Union. There are 27 other governments that she has to make a deal with. And if she can't get a deal with the EU 27, it's all purely fictitious. It's a huge challenge for her to be able to adapt what was a negotiated deal and then satisfy the divergent interests within her own party and within her own Parliament. My guess is that what she'll come up with on Monday is really a statement of direction: Here's what I plan to do. At this point, can she back out of Brexit entirely, saying she's tried her best to make it work? Go back to 2016, she said, “Brexit means Brexit.” Well, that's a meaningless statement. Nobody knows what that means. Remember there were 535 pages of a negotiated deal that was to lead to two years of negotiations. So “Brexit means Brexit” is totally useless. She drew red lines that said: We won't have a customs union, we won't have a single market, we won't allow for open migration. She drew red lines and therefore she basically defined what Brexit meant to her. But that isn't the only possibility. Because there's nobody to take her place. She feels a duty, I think, to her country and she knows that there's nobody else out there who could do as good a job as she, and I think that's probably true. I'm very sympathetic to the position she finds herself in. But I'm not sympathetic to her political capacity, her political skills. I don't think she's very sophisticated as a political actor the way Tony Blair was, for instance. David Cameron wasn't particularly skilled either. He couldn't bring together his own party. He had to have the referendum in order to satisfy the independentists in his own party. Where does that leave May? She feels she's spent the last two years trying to come up with a deal. It hasn't worked. She feels she owes it to the country to carry on with this. She'll have to consume herself in swallowing her own red lines, making accommodations, finding a new arrangement. The possibility still exists that on March 29 at 11 p.m., they're out of the union. And the deadline stays there. They can unilaterally revoke it, but they can't unilaterally extend. 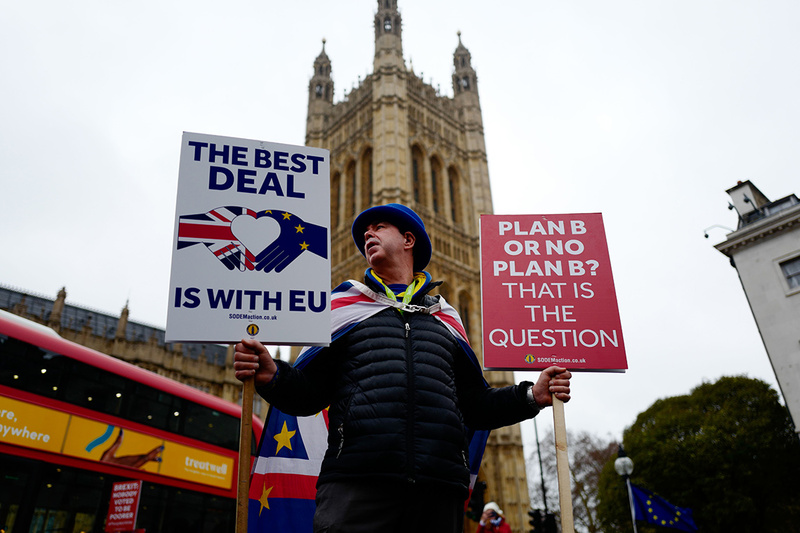 If we reach the deadline and the U.K. hasn't agreed to a new deal, what would the consequences be of a no-deal Brexit? You [also] have a problem of things like regulations for flying. The air regulations are all done in Brussels and it's conceivable that British Airways, Ryanair and all the other airlines in the U.K. would not have landing rights in the EU. It's conceivable that all the medication that is required in Britain, to be imported from the EU, would not meet the regulatory requirements of Britain and not be able to be brought in quickly. You could solve all these problems over time, but you just don't have time. There's a movement for a second referendum, the “people's vote.” Is that likelier to happen now? If you listen to May, the answer is no. She has rejected it several times. The people have spoken, we have to do what they felt was important on June 23, 2016 – even if they've now learned how stupid that was. And she's basically stuck on that and she hasn't moved. Is she going to be able to move? To come back to the prospect of an extension, I think the outcome that would be the best for them is to extend the Article 50 deadline, have a second referendum and pull the plug on the whole thing and call it two years of hell that we didn't fall off the edge of. What are the chances of that? I put them at about 40 per cent. If you had asked me this two months ago, I would've said it was three per cent... And maybe it's increasing and maybe as we get further into it we'll see it's more likely. At this point I'd say it's a crapshoot. Let me rephrase your question: How will history remember Jacob Rees-Mogg, who's led the European Research Group in parliament, the arch-Brexiteer? Like the Upper Class Twit of the Year, which is a Monty Python reference you probably don't know. How will they remember Theresa May? They'll remember her as a valiant fighter, resilient, having the capacity to work tirelessly, to be a democrat but to have been an enormous political failure.